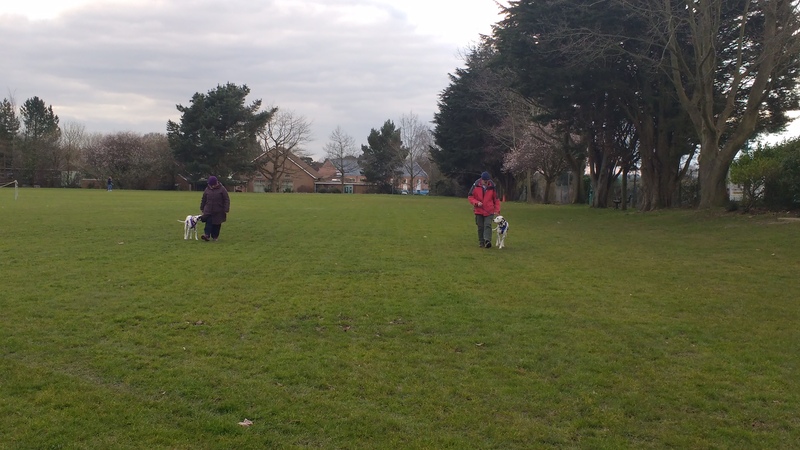 If you do take on a Dalmatian, that has a history of reactivity towards other dogs, then this is a really useful exercise to practise. The parallel walk is a safe and secure way to gradually introduce your dog to other dogs. Obviously the dog that you are hoping to gradually meet, must be a calm and sociable one, so that your dog learns the right communication skills. As the picture shows, both dogs are on the outside of their owners, so that there is added distance between them and the other dog, and there isn’t an opportunity to get into any bouts of prolonged eye contact which can create confrontation. Find a suitable distance apart, where your dog will happily walk along, without feeling the need to react, and as the name suggest, walk parallel to one another. Gradually decrease the distance between you, and eventually do a meet and greet. This won’t necessarily happen in the first session, and you must never push your dog further than it can handle. The more it gets into the habit of reacting towards other dogs, the longer it will take to break the habit. What may have started out as fear or worry, can soon turn into a learnt behaviour, and the dog starts to enjoy being reactive. A trainer or behaviourist can guide you through this, and may have a dog that they can use to do the parallel walking with.